Makarand Garate, son of Mr Prakash Garate (VJTI's groundsman) is a 12th year student and he is recently diagnosed with blood cancer. Makarand is admitted in Dadar's Sushrusha hospital on April 7th. Mr. Garate managed initial expenses and took loan also but now expenses for further treatment are out of his reach. 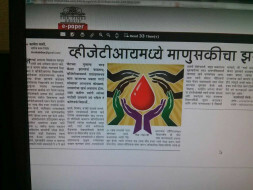 When VJTI's 4 th year students came to know about this, they immediately helped Mr Garate with 1,20,000 INR. Now students are using social media for collecting more money for the treatment. If you are willing to help please use following bank details to deposit money.